Suranga Lakmal (4/13) was the star of the show for Sri Lanka as they restricted India to a meagre 112 score in the first ODI in Dharamsala. In reply, Upul Tharanga (49) put his side in complete control before Angelo Mathews and Niroshan Dickwella ensured the Lankans took the first game by 7 wickets. Brief scores : India 112 ( MS Dhoni 65, Kuldeep Yadav 19; Suranga Lakmal 4/13, Nuwan Pradeep 2/37) lost to Sri Lanka (Upul Tharanga 49, N Dickwella 26; J Bumrah 1/32, B Kumar 1/38) by 7 wickets. India made nine changes to the squad from the side that defeated Sri Lanka 1-0 in the recently-concluded Test series, with the most important one being the inclusion of the inexperienced Shreyas Iyer in place of Virat Kohli. Under new skipper Thisara Perera, Sri Lanka also had eight players exchanging places, most of whom were returning from injuries. With the pitch reminding one much of a Nottinghamshire strip, Perrera decided to let his bowlers have a bite at the wicket first. Rohit Sharma’s captaincy debut got off to a nightmarish start as India’s top-order looked like passenger trains at a station, with no one staying on the pitch more than few minutes. Dharamsala’s turf was proving to be a tough nut to crack as Suranga Lakmal opened with a domineering maiden over. Memories of the Eden Gardens Test were triggered once again with Sri Lankan bowlers looking menacing and Angelo Mathews brought India’s worst nightmares to life, in the second over, when Shikhar Dhawan was caught leg before wicket, reducing India to 0/1. Young Shreyas Iyer came next to join his captain at the crease but the latter didn’t last too long as he nicked a Lakmal beauty to Dickwella. The experienced Dinesh Karthik didn’t stay for long either after his patient build-up of 17 balls went in vain as Lakmal sent him packing for a duck following an LBW. India looked petrified at 8/3 with Manish Pandey, who looked devoid of confidence from the very first ball, stepping in. Mathews struck again in the 13th over as Pandey was dismissed for a meagre 2 runs. Iyer was dismissed three balls later leaving MS Dhoni and Hardik Pandya to handle India’s precarious scoreline of 16/5. Both Pandya and Bhuvneshwar Kumar failed to survive the bowling onslaught and before Dhoni could even settle, India were struggling at 29/7. At the end of the first 10 overs, India had Dhoni, alongside Kuldeep Yadav, trying to salvage the game as the scoreboard read a concerning 29/7. With Lakmal’s fiery spell of 10 overs done, and the ball losing its shine, Dhoni and Kuldeep had an easier purchase than the previous Indian batsmen. And Dhoni stepping out to drive Thisara Perera for the boundary through the covers in the 21st over, pretty much reflected the same. Even Kuldeep was seen hitting two consecutive boundaries off Nuwan Pradeep a few balls later. India’s score kept ticking, as a result, India made it all the way to 60/7 in no time. 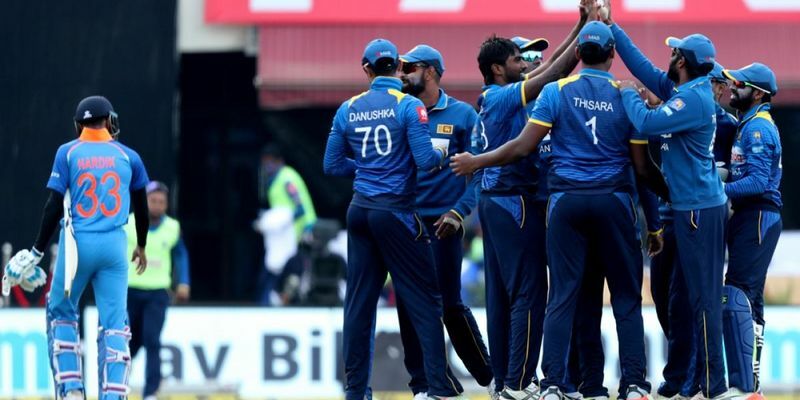 Thisara Perera decided to introduce spin in the form of Akila Dananjaya and the move worked like a charm as the off-break bowler got Yadav stumped in his first over, with Dickwella making no mistakes in reducing India to 80/8. Jasprit Bumrah came next with Dhoni looking desperate to garner as many runs as possible in the remaining overs. The pacer, however, did surprisingly well to stay with Dhoni, who ensured that he kept the lion’s share of the strike, for the next nine overs before his overconfidence led him to attempt a slog sweep off Sachith Pathirana’s delivery and getting bowled. With India at 87/9, Dhoni took the game to the bowlers, hitting 24 runs in the next four overs before his valiant knock of 61 runs finally came to a halt as Danushka Gunathilaka caught him at the sweeper cover, thus ending India’s innings at 112 in 38.2 overs. India needed huge contributions from Bhuvneshwar Kumar and Jasprit Bumrah to churn out an unlikely victory after a torrid day with the bat. With a new ball in their hands, Bhuvneshwar looked lethal in his first over with Gunathilaka and Tharanga struggling to get anywhere close to their seam deliveries. Bumrah looked doubly dangerous in the next over but those close shaves didn’t turn into dismissals and the opening duo grew confident with Tharanga even hitting Bhuvneshwar for a boundary in the next over. Bumrah got sharper in his second over and Gunathilaka was soon caught behind by Dhoni in the fourth over, reducing the visitors to 7/1. The Gujarat bowler could have produced another sucker punch in his third over when Tharanga’s edge was carried comfortably to Karthik standing at gully, but replays showed that the bowler had overstepped, again. Though Bhuvneshwar struck in the immediate next over to pluck out Lahiru Thiramanne, Tharanga went on to do some serious damage before he was dismissed for 49 off just 46 deliveries. But his job was done as the visitors required just 48 runs to win in over 37 overs. Mathews and Dickwella ensured that the Lankans got to their target without any more damage and with an incredible 29 overs to go.